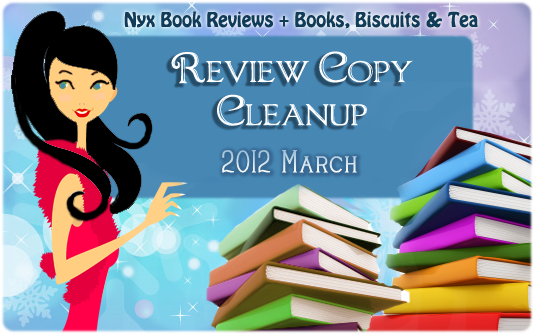 Welcome to the 2012, March Review Copy Cleanup co-hosted by Vicky at Book,Biscuits and Tea and Celine from Nyx Book Reviews. Clean up that big pile of review copies that you've always meant to get around to by joining the Review Copy Cleanup this March . We Book Bloggers have always been swamped with review copies which we try to keep under control but this challenge gives us more incentive to read even more! Make sure to join us to clean up our review copy pile and have some fun in the process! Oh also, did I mention that there's lots of cool prizes to be won? ✦ To sign up, just fill in the Mister Linky form below. Link to your sign up post directly, please! The Linky is the same for both our blogs, so you only have to sign up once. no problem :) it should be fun!